Experiencing the rumblings of the Spirit as we look to a God-honoring revolution of ministry in the midst of culture! This is the blog of Rev. Dr. Robin J. Dugall, Pastor, Professor, Musician, Teacher and follower of Jesus. The Season of Lent "What did you give up for Lent?" I grew up in a neighborhood in Michigan that had two predominant types of Christian experiences and “church” allegiances – Roman Catholic and Lutheran. It was not surprising that we regularly engaged in conversation about “churchy” things…especially when Fridays rolled around (and many of my Catholic friends ate fish…by the way, I didn’t) or when Vacation Bible School, Roller Skating events and Softball leagues at our congregation occurred because everyone in the neighborhood got involved in those activities despite their religious “orientation.” When it came to be late winter and early spring, inevitably somebody talked about the Lenten Season. The season of Lent was talked about, commemorated, and was something that had a significant place in the life of the entire neighborhood. There was a problem though…although I was part of that tradition, I had no clue about it. The Pastor wore purple stoles and there were purple banners hung around the church building…many of my Catholic pals talked about what they were having to “give up” during the season (usually things they didn’t want to give up)…and then, before I knew it, it was Good Friday (something I did “get” even as a kid) and the awesome day of Easter (something of which I still have vivid and wonderful memories). Even so, why we did what we did during Lent and what it was actually all about didn’t really become real to me until years later. Now, that shouldn’t come as a huge surprise especially because Christians often throw words and phrases around that we either misunderstand or assume everyone knows. So, this is what I did…when I got a bit older, I took it upon myself to do a bit of research about the season of Lent…permit me to share a bit of what I learned. Lent is one of the oldest seasons or times of observation/commemoration on the calendar that has guided Christ-followers through the life of faith and the ministry of Jesus for centuries. Like all days and holidays that are considered “holy” (i.e. set apart, different), there have been changes over the centuries on how it is observed, but its purpose has always stayed essentially the same: Lent is a season of self-examination and penitence (repentance, contrition, reflection on our essential brokenness) demonstrated by self-denial, in preparation for Easter. A significant leader in the early Jesus movement, Irenaus of Lyons (c.130-c.200), wrote of such a season…but in his time, Lent only lasted two or three days, not the 40 days that we observe today. In 325 AD, the Council of Nicea (yep, the SAME group of people that wrote the Nicene Creed) discussed a 40-day Lenten season of fasting and self-examination that should be observed by Christ-followers. It's not perfectly clear on whether its original intent was JUST for new Christians to prepare for Baptism (which usually occurred on Easter day) or if it was supposed to be a season held dear by the entire Church. Even so, since that time, Lent has become an annual ritual, a healing and powerful time observed by believers throughout the centuries as a time dedicated to self-denial, sacrifice, spiritual formation, spiritual discipline and prayer. In many traditions, fasting plays a huge role. In history, people were regularly encouraged to fast daily (eating only one meal a day). In other traditions, prayer and confession were the primary focus on the 40-day Lenten journey. Though Lent is still devoutly observed in some mainline Protestant denominations (most notably Catholics, Episcopalians, Lutherans, etc. ), others hardly mention it at all. However, it is interesting to that there seems to be a rise in the significance of and enthusiasm for the Lenten season. Frankly, there cannot be a better emphasis than for all of us to focus on our relationship with Jesus. 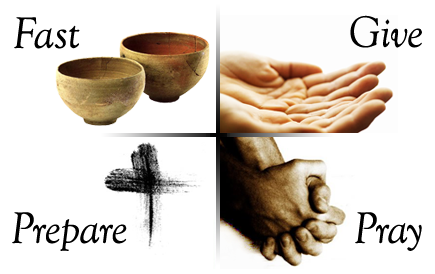 Lent is a time to get in touch with that part of us that is broken and needs healing. It is a season to be able to openly acknowledge our deep desire for transformation and Christlikeness. It is a time that is best summarized in some of Jesus’ actual words in the Sermon on the Mount (Matthew 5-7) where He says that we are “blessed” when we are poor in spirit, meek and when we mourn. That’s really what Lent is about. Take Lent seriously this year…continue your One Year Bible reading…make a worship experience or two during the season (starting with Ash Wednesday worship)…read a Lenten devotional book or look for something that can encourage you in your walk with Jesus (or see more ideas below). That’s my encouragement…and tell you the truth, that’s exactly what I’m doing! As you read the following Lenten prayer, make it a part of your inner desire to be more like Jesus. I encourage you this year to join the Lenten commemoration. In other words, why not set aside the next 40 days to do that which brings you daily into the knowledge of your own brokenness, yearning for healing, desire for transformation, and humility/dependence upon Jesus. As a part of being in this order, you might want to: Read the Psalms during the next forty days. Read 4 Psalms a day and you’ll have time to spare! Keep a journal that gets specific in the areas of confession and your need for forgiveness. Not that you want to hammer yourself…but picking up on the A.C.T.S. method, Adoration, Confession, Thanksgiving, Supplication will keep your heart and mind focused in your prayer time. Fast at least one day per week up until Easter. Daily take 10 to 15 minutes simply to reflect on the areas of your life that need transformation. In other words, what will make you a more faithful Christ-follower? What are those areas in your life that “get in the way” of you being who Jesus wants you to be? Continue or start the habit of reading the One Year Bible – yes, you can start now. No problem! Last but not least, take some time each week to confess to another person. That is powerful! James 5:16 says, “Confess your sins to one another and pray for one another so that you may be healed”. Take a risk! Brokenness…a trying but important journey! Ann Voscamp rarely disappoints – advice for crazy people with crazy lives! Yes to this article! Character counts! Dan on Wisdom of Wolves! rdugall on Wisdom of Wolves!